The Cathedral St. Mary in Linz is said to be the biggest Cathedral in Austria. 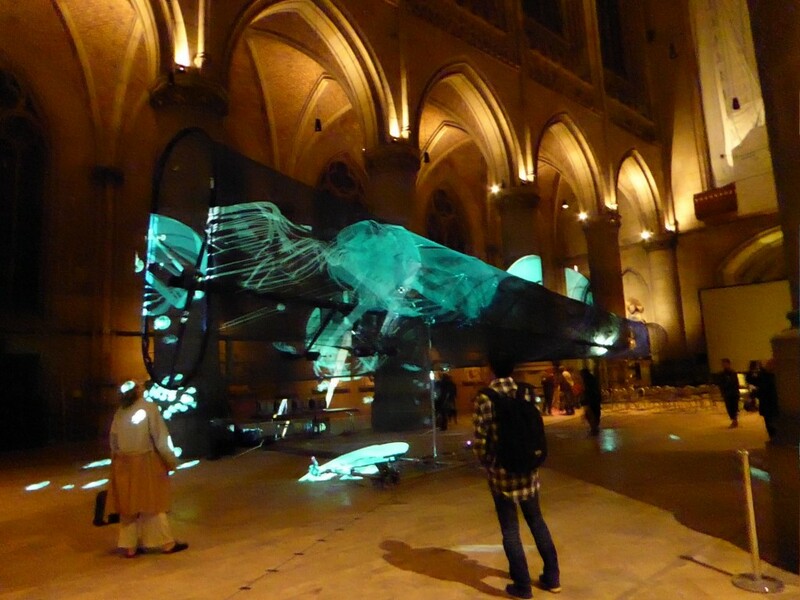 The huge nave is the host of LightScale II, a kinetic light and sound sculpture-installation by Uwe Rieger. Gently moving according to the impulses given by the audience, the mesh-sculpture supporting the projections appears as a alien peaceful creature trying to enter in communication with us through a sound composition that resembles whale songs. It is a beautiful, calming and a bit melancolic work that invites to stop and listen, to it, but also, may be to each other. Ce contenu a été publié dans Blog, avec comme mot(s)-clé(s) Ars Electronica, kinetic installation, Uwe Rieger. Vous pouvez le mettre en favoris avec ce permalien.